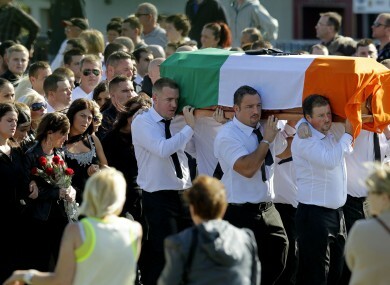 Alan Ryan's coffin is carried through Donaghmede as members of his family mourn his death earlier today. THE FUNERAL OF the Real IRA member Alan Ryan has taken place in Dublin today with a strong Garda presence at the ceremony in the north of the city. Traffic restrictions were in place in the Donaghmede area as a service took place at the Church of the Holy Trinity with hundred of mourners in attendance. Pictures from the event showed masked men and women in paramilitary clothing also in attendance. Armed Gardaí were reported to be outside the home of Ryan prior to his coffin being removed to the church. Ryan, 31, was shot dead in Clongriffin on Monday in an incident in which another man was also injured. Gardaí have since arrested one men in connection with the shooting. Ryan was known to gardaí after being convicted of taking part in a Real IRA training camp in Meath in 2001 as well as having another conviction for possession of firearms. Email “Heavy Garda presence but no incidents reported at Alan Ryan funeral ”. Feedback on “Heavy Garda presence but no incidents reported at Alan Ryan funeral ”.